Did you know that your irrigation water may be up to 26,000 years old? That’s because it is brought to you by the Florida Aquifer. The fresh water beneath the peninsula we call home has been gathering in layers of rock since the last Ice Age and we tap this resource daily to provide for our growing populations. 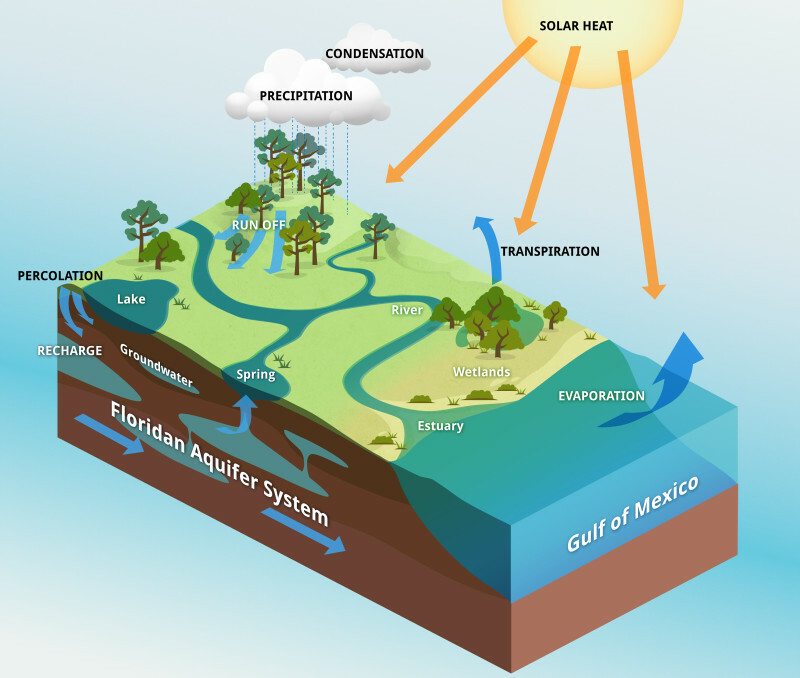 Everyone in Florida uses water from the aquifer – from drinking, to dish washing, to irrigating. It’s an important reserve. The water that we gather from the aquifer, unlike ocean water, doesn’t require expensive treatment to remove salt. That’s why water conservation has become a growing topic of discussion throughout the state. Did you know that 50-80% of a household water budget is used on landscape irrigation? You may think that is a high number but with the introduction of automatic irrigation it’s easy to set the system and forget about it. When your irrigation is running in the late hours of the night or early hours of the morning, you may not even consider the amount of water being used. But every drop counts. As we approach Florida’s rainy season let’s consider some of the ways you can make sure your irrigation system is using water efficiently. Know your watering days: During Daylight Saving Time from March to October the following watering days are observed: Homes with odd-numbered addresses water Wednesdays and Saturdays. Homes with even-numbered addresses water Thursdays and Sundays. Non-residential/commercial addresses water Tuesdays and Fridays. If you have a reclaimed system you may water two times per week year-round. Water wisely: New sod and landscape may be watered for 30 days after installation but may require approval from your county to avoid violation of watering restrictions. No watering between 10:00am and 4:00pm. This is the hottest time of the day and much of the water supplied by the system will be lost to evaporation. It doesn’t make sense for your landscape, the water used, or your wallet. skips watering cycles after moderate to heavy rainfall and is required by Florida law for all automatic irrigation systems. This inexpensive and valuable tool will keep unnecessary water out of the landscape. Consider other water conserving products for your system: Did you know your irrigation system could talk to Alexa? Smart and WiFi capable controllers are hitting the market. Coupling the simplicity of smartphone control with satellite weather data, these products are the new face of water conservation. Other products to consider include low-flow nozzles which reduce water output and drip irrigation that specifically targets root zones. Get Florida-Friendly: When landscaping, install low-maintenance and drought tolerant plant material that naturally requires less water, and skip the monotony of St. Augustine. Using plants suited to your landscape has the added benefit of reducing waste and pollution, creating wildlife habitat, and preventing erosion.